PHOENIX – Suspending operations just two weeks before the end of its inaugural 10-week season, attempts to continue the upstart Alliance of American Football will be difficult, Don Gibson, a professor at Arizona State University’s Sandra Day O’Connor College of Law, said. The AAF is the latest of several expansion football leagues to run into issues, including the World Football League, the United States Football League and the XFL, which folded in 1975, 1985 and 2001, respectively. Despite plans by World Wrestling Entertainment CEO Vince McMahon to bring the XFL back in 2020, the viability of alternatives to the NFL remains in question. 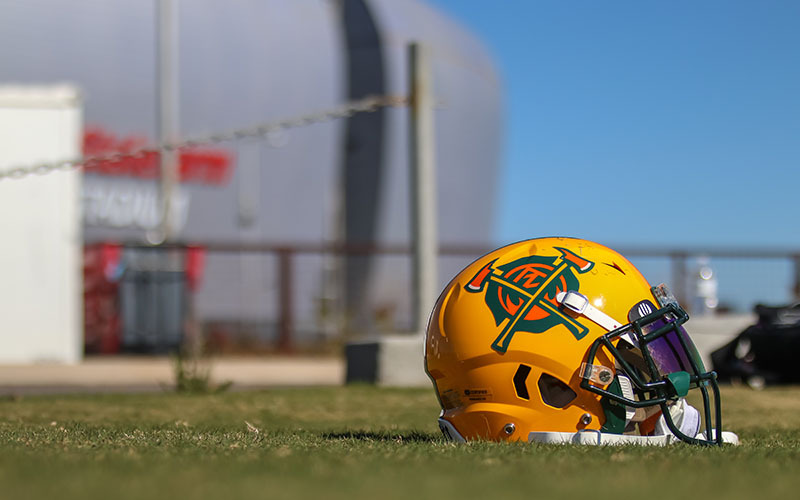 The eight-team league includes the Arizona Hotshots, who were leading the league’s Western Conference with a 5-3 record and played their home games at Sun Devil Stadium. Multiple media reports throughout the day Tuesday said the league would suspend operations. Late Tuesday, the Hotshots confirmed the reports via Twitter. According to an email that went out earlier in the day to league employees, there are plans to keep a small staff in place and seek “new investment capital and restructure” the business. The decision to suspend operations promises to have ripple effects on everything from corporate partners to team employees, including about 20 people who work in a variety of business roles for the Hotshots. The email told employees that if they were not contacted, their employment would be terminated Wednesday and they will be paid up until that date. AAF players relished their brief experience in the league. How you get fired on your day off?? AAF co-founder Bill Polian issued a statement saying that he was “extremely disappointed” that league chairman Tom Dundon had decided to cease operations. Games often played in stadiums that were less than half full, something Gibson said can damage broadcast partners too. Opening weekend AAF games in February drew better ratings than the NBA, according to CBSSports.com. Games were broadcast each week by a combination of CBS, CBS Sports Network, NFL Network, Bleacher Report Live and TNT. Those broadcasts flowed through Scottsdale’s Sneaky Big Studios. The north Scottsdale facility founded in 2016 by Bob Parsons partnered with the league to produce game telecasts and pregame, postgame and halftime shows from its studios in north Scottsdale. Sneaky Big declined comment to Cronkite News. The decision to suspend operation came from Dundon, who with his investment earlier this year became majority owner. He also owns the Carolina Hurricanes of the NHL. When reports of the shutdown came out Tuesday, Orlando Apollos coach Steve Spurrier said his team, which led the Eastern Conference with a 7-1 record, should be declared champions. Their only loss came against the Hotshots, 22-17. That prompted Arizona coach Rick Neuheisel to tweet a response.